Far too many people are trapped in poverty in middle-income countries like South Africa. Over the next few weeks ANN BERNSTEIN will argue that instead of programmes that ameliorate poverty, we should focus more attention on eradicating it; focus less on inequality and far more on how to expand dramatically the opportunities available to poor people. In the past few decades, global poverty has fallen for an expanding population. The key cause of this stunning advance was economic growth. Too often governments in India, Brazil, Mexico and South Africa focus on increasing grants and other redistributive programmes, rather than on growing their economies. Today’s article spells out the implications of the fact that in the past few decades more people have moved out of poverty – and more quickly than ever before in human history. When the history of the late 20th and early 21st centuries is written, its most striking feature will be the remarkable fact that this period witnessed the fastest decline in poverty for the largest number of people in the history of humanity. In 2010, the Millennium Development Goal of halving global poverty rates by 2015 was attained. This was five years faster than anticipated when the goals were developed. In 1990, some 1.9-billion people (or 43% of the world’s population) had incomes of less than $1 a day; by 2010, there were 1.2-billion people (21% of a larger global population) living below a slightly higher poverty line of $1.25 a day. The main cause of this astonishing improvement in human welfare was economic growth. The economies of the three regions of the world that are home to the vast majority of the world’s poor had all grown rapidly: at 8% per year in East Asia, 7% in South Asia, and 5% in Africa. This era of global economic growth saw the first fall in global inequality of household income since the early 19th century. Notwithstanding this vast reduction in global poverty, more and more attention is devoted to issues of inequality by policy-makers and opinion leaders across the world. One reason is that, while inequality has fallen if one looks at humanity as a whole and between countries of the Global North and the emerging economies of the Global South, inequality has risen within many countries, developed and developing. The political salience of rising inequality in the developed world, along with the outsized role of developed world priorities, continue to influence the way political and economic issues are shaped in all countries. In this context, the issue of inequality has become increasingly important in framing policy debate in developing countries too. It is, however, strange that rising inequality in North America and Europe should be a more significant determinant of global debates about how to tackle poverty in the developing world than the remarkable fact that poverty rates have fallen from 90% to 10% in China in the last 40 years. That income inequality may have risen in China seems considerably less relevant than the reality that hundreds of millions of Chinese people are now living vastly more prosperous lives. Despite the scale of poverty reduction across the world, many people remain in desperate circumstances. Poverty in middle-income countries remains unacceptably high: 68% of Indians live on less than $1.25 per day, along with 55% of Indonesians, 37% of Filipinos and 33% of South Africans. Large numbers of people also live just above the poverty line and are vulnerable to falling back as many are starting to do in Brazil and South Africa as their respective political and economic crises unfold. Too often, the response to poverty in countries like India, Mexico, Brazil, South Africa and elsewhere has the wrong emphasis. Governments focus on increasing grants and other redistributive programmes rather than on growing their economies. Of course, societies should provide direct assistance to poor people, but we should not exaggerate the impact of these efforts. Most forms of redistributive intervention do no more than ameliorate poverty without changing people’s prospects meaningfully. Consider, in this regard, Brazil’s Bolsa Familia: a successful programme which can only ever have a limited impact on improving beneficiaries’ chances to escape poverty and move into the middle class. Bolsa Familia provides benefits to every Brazilian family that has at least one child and earns less than about $45 per month. In 2013, approximately 13-million families benefited from the programme (about 52-million people or 28% of Brazil’s population). In spite of its large size, the programme costs about 0.5% of the country’s GDP because the value of the grants is small. For the same reason, it only reduces the proportion of the population that is poor by just over 1.5 percentage points. The programme’s impact on education, healthcare and other human capital improvements has been small or non-existent, and it does little to help poor Brazilians become more employable, entrepreneurial or productive. These are all outcomes that more effective, anti-poverty interventions should seek to achieve. As it stands, Bolsa Familia is not, as one review of it notes, “an opportunity-generation programme”. Another good example of a programme that serves only to ameliorate poverty is India’s public distribution system (PDS), which distributes rice and wheat through fair-price shops at subsidised rates for families officially classified as below the poverty line. These families are issued ration cards with which they can make purchases through the PDS. If a family’s total income rises even marginally above the baseline that determines poverty, it cannot legitimately get a ration card and cannot access the PDS. Apart from the dependency that this feeding scheme encourages, it is also a breeding ground for corruption. Food that is supposed to help the poor is channelled to members of the middle class, while corrupt officials siphon off resources designed to fight poverty at an alarming rate. India’s Mahatma Gandhi National Rural Employment Guarantee Act is another intervention that promises much but delivers little to change the prospects of the rural poor. It is supposed to guarantee 100 days of low-wage work a year to anybody in rural India who needs it. Despite being cast as a game changer, funding is below 0.3% of GDP and the programme has been marked largely by its non-performance in states where it was supposed to make the most difference. As a result, its impact on reducing poverty has been minimal. There are no plans to use the scheme to improve infrastructure in poor areas, add to the skills of beneficiaries, or provide people with opportunities to move out of poverty. The Indian experience suggests that providing poor people with nominal public employment opportunities on a “right to work” basis does not do very much to improve their welfare and does even less to transform poor people’s access to new prospects through which they could pull themselves out of poverty. Similar limitations beset the Expanded Public Works Programme (EPWP) in South Africa. The programme aims to create six-million “employment opportunities” over five years, but it does little to get anyone out of poverty: the “opportunities” are temporary, provide little if any training and offer no prospect of future employment. More generally, redistributive policies can reduce poverty, but it is not always clear that they do so in ways that empower beneficiaries or lead to meaningful social and economic inclusion. Many “experts”, in talking or thinking about development, seem to assume the helplessness of the poor and believe that they can achieve little without assistance. They are wrong. Across the developing world, experience and research have shown that poverty is a condition, not a characteristic of people. Those who live in poverty are as hard-working and enterprising as those who are better off. What they lack principally are opportunities. Given the opportunity to succeed, most will. Policies that expand access to routes out of poverty are most likely to facilitate rapid improvement in poor people’s prospects. This is the most plausible way for developing countries like South Africa to become more prosperous, inclusive and just. Harvard’s Ricardo Hausmann put it another way: he said in South Africa we compensate the poor for their exclusion instead of focusing on more effective methods of inclusion. How, then, should we think about these challenges? Developing countries should aim to put as many poor families as possible on a path leading out of poverty and into the middle class. This means that countries like South Africa should not prioritise policies whose principal effect is to ameliorate poverty rather than end it. Helping the poor cope with poverty a little better may be necessary, especially in the most unequal and poor countries, but policy-makers’ goals need to be more ambitious. They should aim to permanently change the circumstances of millions of poor families for the better. In addition, they should be held to account for this by their societies and electorates. 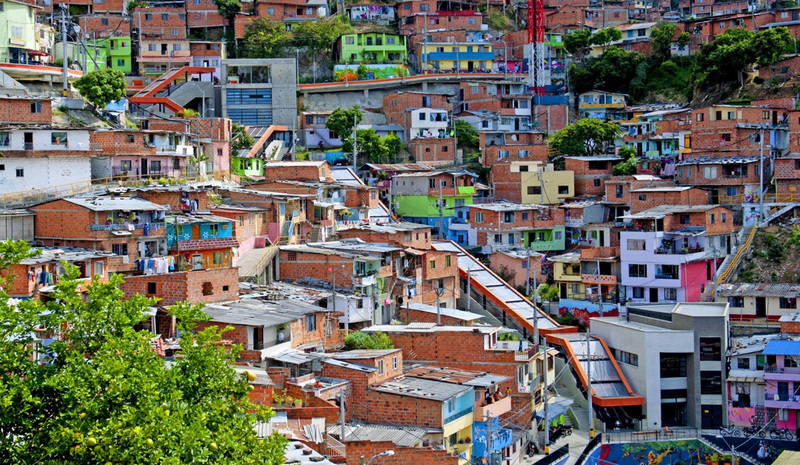 Photo: Escalators out of poverty: in Comuna 13, a poor area in Medellin, Colombia, a giant 384-meter orange-roofed escalator, installed in 2011, scales the mountain in six sections. A journey that was previously all but impossible now takes just six minutes and makes it easier for residents to access economic opportunities located across the city.